The night’s final bow belonged to Carter, whose jam with less than a second remaining pushed him past 25,000 career points. He became the 22nd NBA player to reach the milestone and then tossed some love toward the Raptors. Carter, who played his first seven seasons with Toronto, began the night 13 points shy of the mark. The Hawks were pulling for Carter, in his 21st season, to reach the milestone against his former team. After the game, Carter’s teammates were like fans looking for souvenirs. Carter, 41, didn’t seem to mind. Carter sank a 3-pointer with less than two minutes remaining and, clearly aiming for the milestone, missed two more 3s before being fouled with 33.9 seconds remaining. Carter pulled with one point of 25,000 when he sank two free throws after a video review overruled the original call he was fouled on a 3-pointer. 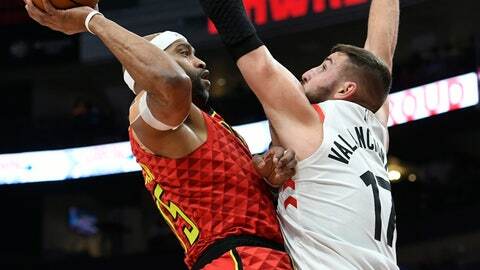 On Atlanta’s final possession, he missed a jumper before rookie Kevin Huerter grabbed the rebound and passed back to Carter, setting up the buzzer-beating jam. Carter’s 14 points gave him 25,001 for his career. Players from both teams hugged Carter at midcourt. Jonas Valanciunas had season-high totals of 24 points and 13 rebounds for the Raptors (15-4). Pascal Siakam had 22 points. Jeremy Lin scored 26 points off the bench for the Hawks (3-15), who have lost nine straight since their last win against Miami on Nov. 3. Atlanta’s only starter to score in double figures was Taurean Prince with 12 points. The teams combined to miss 14 straight shots from the field to open the game before Lowry finally sank a jumper. He followed up with a 3-pointer, and the Raptors never lost the lead. The Raptors led 55-44 at halftime. Toronto stretched the lead to 20 points for the first time at 100-80 on Danny Green’s 3-pointer midway through the final period. Carter’s milestone was popular with players for both teams. Raptors: OG Anunoby (sprained right wrist) and C.J. Miles (right adductor strain) did not play. … The Raptors improved to 8-2 on the road. The Raptors rested top scorer Kawhi Leonard on the second day of back-to-back games. That has been the standard practice with Leonard, but coach Nick Nurse said “we’re getting closer” to Leonard playing in consecutive days. Lowry left the game with a bloody nose with 4:09 remaining. No foul was called, despite his protests to officials as he held a towel to his face. He returned to the game. Raptors: Host Washington on Friday night. Hawks: Host Boston on Friday night.